Gas boilers are the most economical and convenient method of heating. If your electric bill has gone through the roof, consider contacting us, for a competitively priced boiler installation quote. Our experienced heating engineers can ensure that you get the most from your boiler and that it remains reliable. There’s nothing worse than waking up on what seems like the coldest day of winter, only to discover you have no hot water or heating. Fear not, the gas engineers at our company can be with you and tending to your emergency boiler repair in under 30 minutes. Our highly-skilled heating engineers know their way around all types of boiler, whether commercial or domestic, combination or conventional. Ensure you call a team of heating engineers you can trust, ensure you call All services 4 U. If your boiler is over 10 years old, it’s a good idea to plan for its replacement, rather than have it stop working suddenly – and with All services 4 U able to advise you on the latest models and install a new boiler at a time convenient to you, there’s never been a better time to do so. Having a new, modern, energy-efficient boiler installed will not only minimise the risk of a breakdown this winter, it’ll also save you vast amounts on your energy bills. The latest condensing boilers are available as a combination or regular model. Combination boilers provide both heating and hot water on demand, firing up when you turn on a hot tap, thus negating any need for a storage tank. A regular boiler, on the other hand, delivers your central heating on demand, but will only heat a quantity of water, which is held in storage until required. Whichever you choose, a fully-trained gas safe registered All services 4 U installer can complete your boiler installation any time you choose to the highest standards. 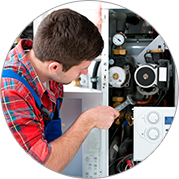 They can undertake boiler replacements, boiler installation and boiler maintenance, both for commercial and domestic customers. With years of experience under our belts, installing and maintaining your boiler or central heating system is easy for us. All of our staff are highly trained in all aspects of gas boiler and central heating technology, so whether it’s an old system or a brand new one that’s malfunctioning, just call us at any time, day or night and we’ll have your heating up and running again in no time.